Oconee Forest Park is a 60 acre natural area nestled behind the Intramural Fields of the University of Georgia in Athens, GA. Administered by the Warnell School of Forestry and Natural Resources, Oconee Forest Park offers recreational, educational, and research opportunities for the University and Athens community, while preserving its 100-year-old forest. Visit Oconee Forest Park Today! It is directly behind the Intramural Fields at the University of Georgia, so when you turn onto Alumni Dr. from College Station Road, continue to follow the paved road all the way to the back of the complex. You can turn left at the Tennis Courts to reach one entrance; this is the closest one to the ADA Accessible Boardwalk that crosses Lake Herrick. Another entrance can be found if you continue on the road until it dead ends at the gravel parking lot. Need Directions or a Map? There are many educational opportunities at Oconee Forest Park. 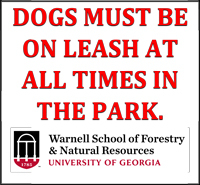 Students at the University of Georgia are encouraged to use the Park as an outdoor laboratory, although there is plenty of informal learning available. Why not take a class to learn native plant species? Bring your binoculars and take a seat for wildlife watching. There is plenty to learn at Oconee Forest Park, so come out today! There are miles of hiking and mountain biking trails at Oconee Forms Park. Trail running is one of the favorites among visitors because of the natural dirt and gravel trails. Even though Oconee Forest Park has a plethora of awesome activities, it's not hard to find solitude, peace, and quiet among this old oak-hickory forest. Check out the other activities at Oconee Forest Park. Social Trails are causing problems for both the ecosystem and Oconee Forest Park managers. Many times, visitors don't even realize what they are doing when they walk slightly off of the trail, and unfortunately this causes unintended damage to the forest. What is a social trail? A social trail is an informal trail created by users in an area that often causes erosion, vegetation loss, and habitat fragmentation. They are often created in order to short-cut to another area of the park, or to reach an area of the park that can't be reached by the pre-defined trails. Visitors may wish to use social trails to find peace and quiet, or partipate in appropriate recreational acivities such as fishing, hiking, studying, or wildlife watching. This makes sense, as park managers cannot provide access to all the places that visitors may want to go. The problem with social trails is that these trails often cause damage to the ecosystem. If the trail is on a steep grade, severe erosion is most often a consequence. Even for trails on flat ground, soil, vegetation, and animal habitats can be compromised from heavy traffic. 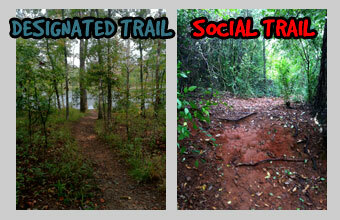 Please do your part to keep Oconee Forest Beautiful by simply staying on the designated trails. Handicap access to Oconee Forest Park is provided by the A.D.A.- compliant boardwalk and bridge donated by the family of Leon A. and Eugenia C. Hargreaves. The boardwalk begins at the parking lot near the tennis courts.